I took two running steps and jumped. 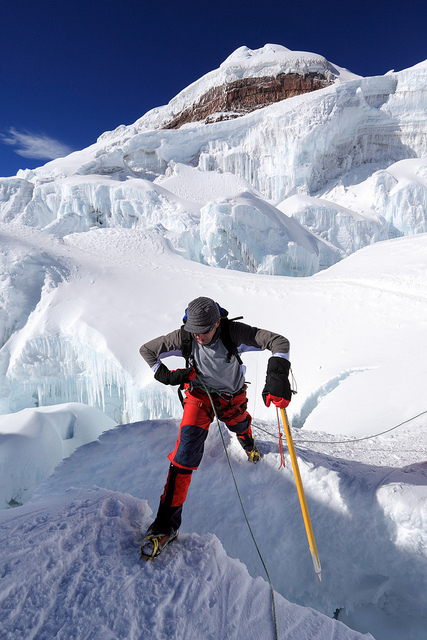 Francisco and Andy watched from the other side of the ice crevasse, all three of us connected by a climbing rope. The crampons on my boots landed firmly in the snow and brought me to an abrupt stop. It was 3am. My headlamp shone on Francisco and Andy’s red faces, their breath condensing in the thin, gelid air. We’d been climbing since 1am and the summit was still several hours away. I hadn’t planned on undertaking anything quite so strenuous. I’d recently returned from an idyllic week in the Galapagos, and – after three straight days working through photos in my hotel room – I was hoping to get a little exercise and fresh air before meeting Marie in Colombia. So I stopped by one of Quito’s ubiquitous travel agencies and asked if they had any open spots on some kind of short hiking trip. “How about Cotopaxi?” suggested the agent. 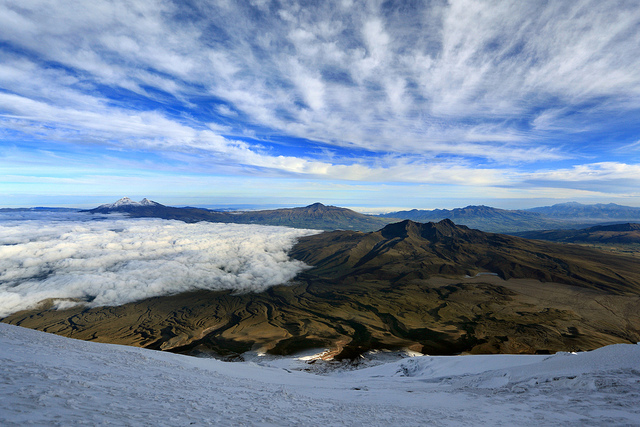 “A hike in Cotopaxi National Park?” Volcán Cotopaxi, just 30 miles south of Quito, is Ecuador’s second-highest mountain. 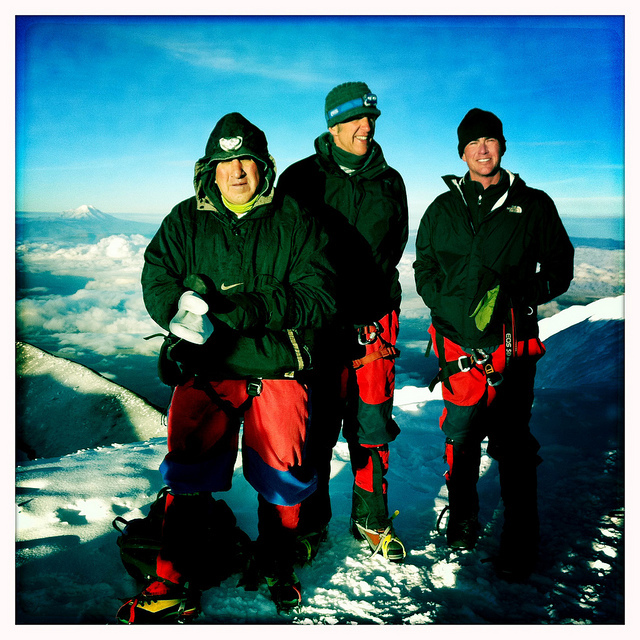 I’d visited Cotopaxi during a month-long trip around Ecuador in 2001, and I remembered feeling sorry for the climbers who planned to stay at the refugio and make an early-morning attempt at the summit. It looked really cold up there. “I don’t have any gear,” I told the agent, hoping that might excuse me. “No experience necessary,” said the agent with a smile. He knew he had me. Fifteen minutes later I was trying on boots and snow pants. Our group left Quito the next morning. There were 12 of us: eight tourists and four guides. I was paired with Andy, a middle-aged Brit, and we were assigned to Francisco, a taciturn Ecuadorian guide who spoke no English. The other tourists were Swiss, French, and Swedish – all young and in good shape. At the park entrance we geared up. My climbing boots were as stiff, cumbersome, and heavy as ski boots. I either wore or carried three jackets (fleece, down, and waterproof), two t-shirts, fleece pants, waterproof pants, light gloves, heavy gloves, a ski cap, a balaclava, two pairs of socks, my iPhone and my camera. Water and food took up the remaining space in my backpack, so I strapped my sleeping bag, ice axe and crampons to exterior straps. 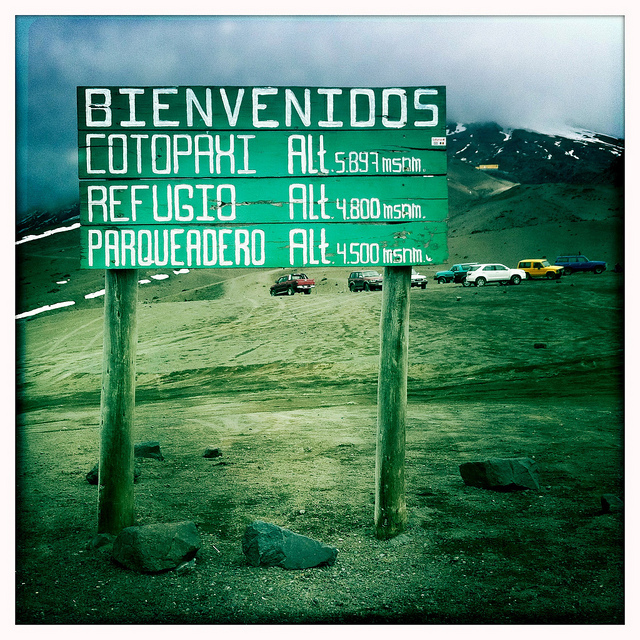 We drove as far up the mountain as possible, to a parking lot 4,500 meters above sea level. 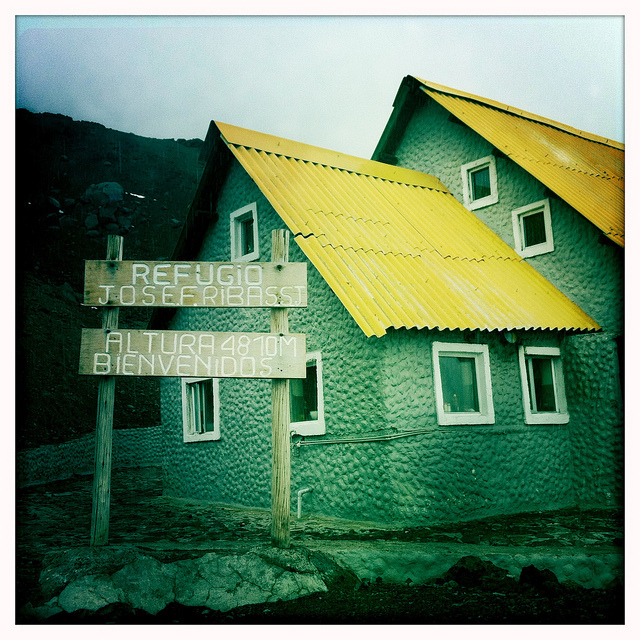 From there we hiked to the refugio, 300 meters higher than the parking lot, and arrived in the early afternoon. The short climb left me gasping for air. “How many acclimatizing hikes did you do?” asked Andy. Yikes. 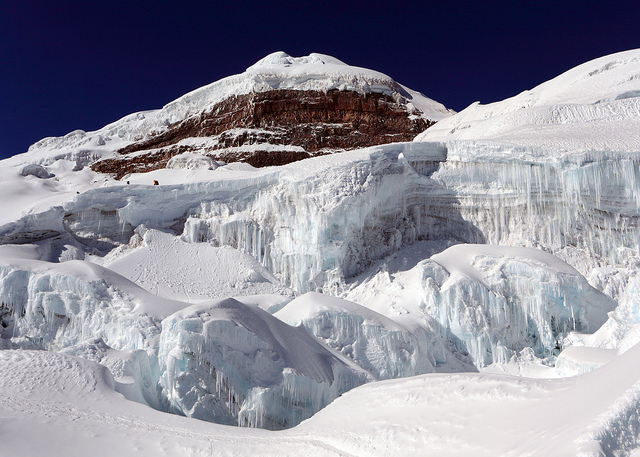 At 5,897 meters (19,348 feet), the summit of Cotopaxi is two meters higher than Mt. Kilimanjaro’s Uhuru Peak. Almost all attempts at Uhuru Peak are made after at least three nights of gradual acclimatization. 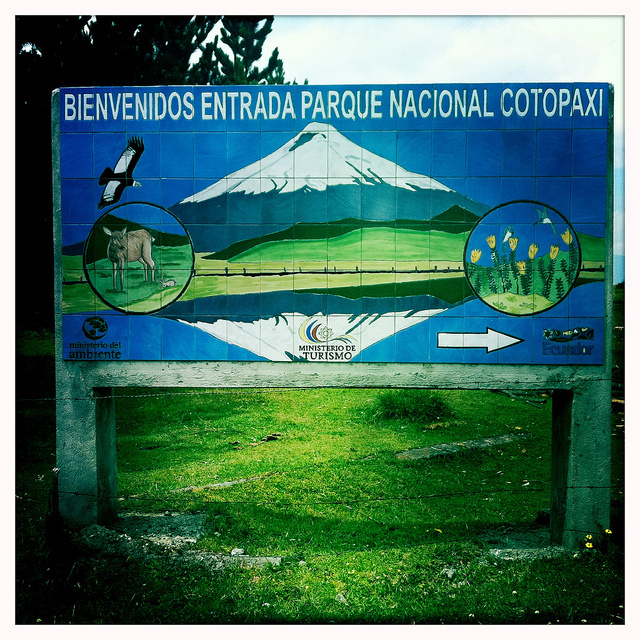 Our shot at Cotopaxi would begin in just nine hours. Was this really a good idea? We dropped our gear in the refugio’s big dorm room and ate a late lunch in the dining hall. Two short hours later we returned to the dining hall for an early dinner, trying our best to stuff more food into still-full stomachs that were also slightly nauseous from the altitude. We heard a light tapping on the roof and realized it had started hailing. “Try to get some sleep,” our guides told us after dinner. “But don’t worry if you can’t sleep. That’s normal. We’ll wake you up in about four hours.” I couldn’t sleep. Everyone in the dorm room was restless. Headlamps flashed on and off. People tossed, turned, and talked. I was relieved when the guides told us it was time to wake up. We put on our gear, tried once more to eat, and then stepped out into the cold. The sky had cleared and the lights of Quito glowed orange in the distance. At first we hiked on volcanic scree, but we quickly reached the glacier and had to attach our crampons. Soon afterwards we stopped again to rope ourselves together. Francisco set a brisk pace. He, Andy and I began with the rest of the group but eventually left the others behind. I remembered my Kilimanjaro experience and resolved to stage a slowdown if we were in danger of reaching the summit before sunrise. It turns out I didn’t need to worry. 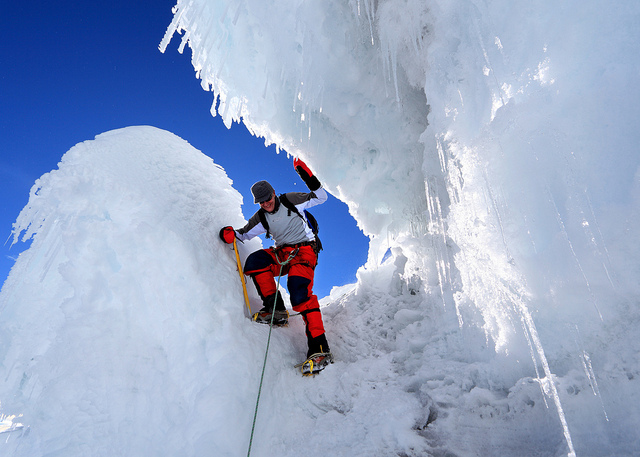 Up until about 5,400 meters Andy was clearly the stronger climber, but altitude sickness – a strange phenomenon that seems indifferent to age and fitness – eventually hobbled him. “I’m knackered,” he said. Glimpses of dramatic ice formations appeared in the tunnels of light cast by our headlamps. 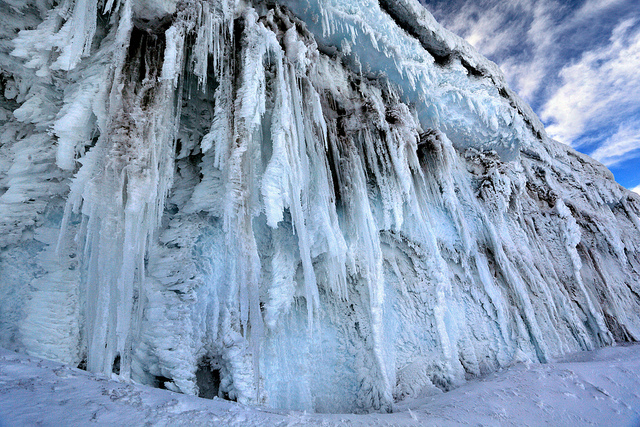 Massive icicles hung from the edges of frozen cliffs and sinister-looking crevasses dropped into total darkness. The trail sometimes rose so steeply that we had to plant our ice axes for support and literally crawl forward on our hands and knees. I clumsily dropped one of my gloves, which proceeded to slide 15 feet down an icy slope. Francisco, worried about safety, told me to stay put while he retrieved the glove himself. I felt guilty until Andy’s headlamp, just ten minutes later, slipped loose and skidded so far down the mountainside that I started laughing, convinced it was lost. Francisco, however, just detached himself from our rope, hiked down into the blue-black void, and returned with the headlamp. The first sign of light finally appeared in the east. “We’re close,” Francisco told us. “Maybe another hour.” I was exhausted but Andy had it worse. Our pace slowed again and the Swedish couple overtook us. Every step required conscious effort. But the growing pre-dawn light and the proximity of our goal motivated us, and we reached the summit just as the first rays of sun broke through a layer of clouds. I was as high as I’d ever been on the surface of the Earth. The view was truly incredible. 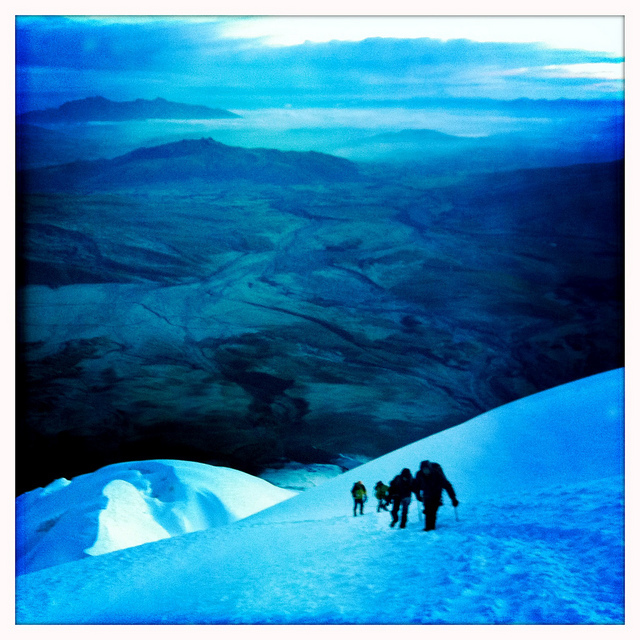 We looked down on Cotopaxi’s crater, steaming in the cold morning air. 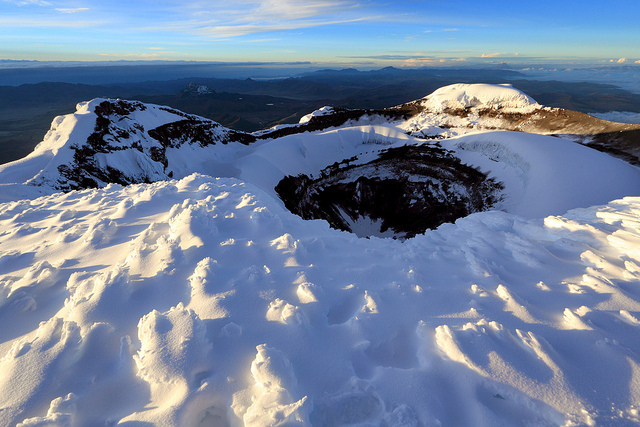 Other volcanic peaks loomed in the distance, including Chimborazo to the south and Antisana and Cayambe to the north. A sea of low clouds blanketed the countryside to the west. I broke out my big camera and tried to capture a small part of the beauty. We spent a half hour on the summit before beginning our descent. Francisco told me to take the lead, with Andy immediately behind, and – given that Andy was still knackered – I had to walk slowly or the rope would jerk him forward. Francisco tried to hurry us up. “Roberto, like this!” he yelled, and then jogged quickly forward. I followed Francisco’s instructions and promptly yanked Andy off his feet. Trapped in a no-win situation, I encouraged either Andy or Francisco to take the lead, but both refused. So I went slowly and stopped frequently to photograph all the scenes the darkness had hidden during our ascent. By mid-afternoon I was back in Quito – tired, hungry, and caffeine-deprived, but also very happy that I’d stumbled across a perfect ending to my time in Ecuador.